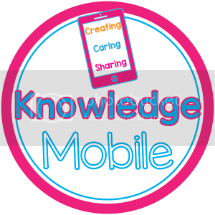 This week's featured teacher is Bri of Knowledge Mobile. What is your best advice for a beginning teacher? Find a mentor who is invested in seeing you succeed. You can't, won't, and shouldn't know everything. As great as Pinterest is, you need a real live person to talk to and run your ideas by. I remember being so excited by a lesson that I shared with my mentor teacher and she literally shot it down because I hadn't planned for management or my expectations. Always look for someone who will push you to grow. Always look for ways to push yourself. 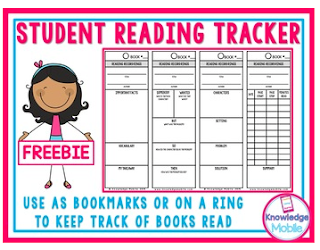 Bri would like to share her Student Reading Tracker Freebie from her TpT Store. You can download the file by clicking on the picture below. If you download this freebie (there are lots more in Bri's store! ), don't forget to leave Bri some feedback for her generosity. You can do this by clicking on "My Purchases" and finding the download in your "Free Downloads" tab. Don't forget to check out Bri's blog for Feature Teacher Tuesday. I was featured a few months ago! Thanks, Bri, for participating in this week's Feature Teacher! I am filling up my Wish List with items from your store in case I ever move back into early primary.